At The Trolley Shop we carry a total range of parts for shopping trolleys and stock trolleys. We deliver to the metropolitan area. Country deliveries can be organised through your transport company. At The Trolley Shop we carry a range of shopping carts to suit a variety of purposes. The Trolley Shop can organise art work for your trolley’s handles and as a unique feature, all of our trolleys can include a laser plate of your business name. 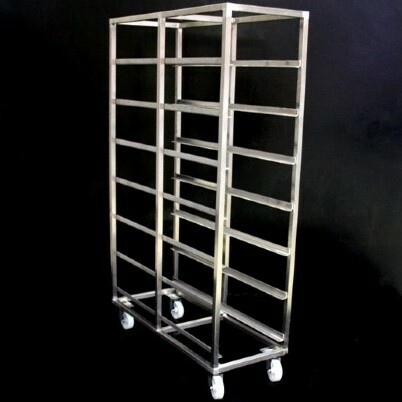 We offer custom made trolleys to suit your requirements. There is also a number of different coloured plastic components that can be ordered to suit your business identity. 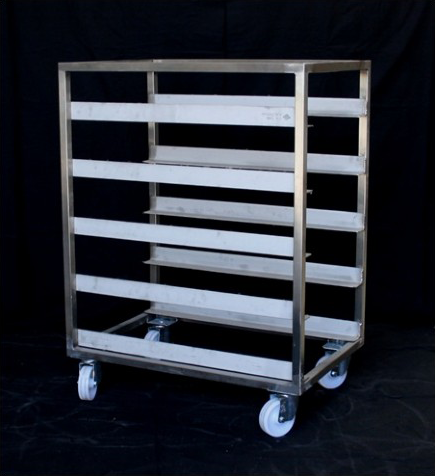 At The Trolley shop we carry a range of bakers and meat racks for use in bakeries and butchers. They can be made as per standard design, or shelves can be made at any height required by the client for cake making or if they require something larger for roast meats. Being made in WA has its advantages because if a problem arises, our mobile service vehicles can attend ASAP and solve the problem, thus allowing very low down time of equipment. “Our servicemen can change wheels re-weld fatigued metals replace rake shelving and repair or replace work benches and adjustable height tables after your bakers and butchers have finished for the day. Ensuring the client has their equipment back in service promptly is of great importance to us as we pride ourselves on great customer service. We also have spare racks available for loan to clients if equipment has to be taken away for repair, once again saving clients down time. Contact The Trolley Shop if you would like to enquire about our range of bakers and meat racks. *1500mm x 730mm Large Stock TrolleyPlease contact The Trolley Shop if you would like to enquire about our range of stock trolleys. 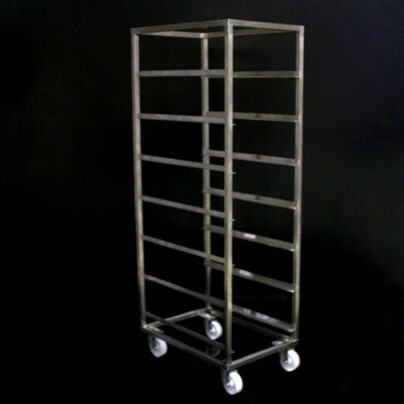 The Trolley Shop also stock a large range of ancillary products for the retail industry. We also make customised equipment so if you have an idea we can probably make it to suit your needs. Roll cages use the latest technology to transport stock from DC warehouses to retail outlets. They are light weight easily moveable, hold as much as a pallet and require no license to operate.Roll cages are filled with stock at the warehouse, rolled onto and off the transport and then into the store ready to be shelved for sale. This means limited down time whilst waiting for a licensed fork lift operator to move pallets and no lifting of heavy wooden pallets. The roll cage is far more functional and pleasing to the eye than dropping a pallet in the middle of an isle while customers try to negotiate a trolley around it. Contact The Trolley Shop if you would like to enquire about our range of roll cages. Based in O’Connor, Western Australia, The Trolley Shop is the largest supplier of mobile retail equipment in WA. We’ve got whatever you need, or we can make it! Unlike other trolley companies, we stock all of our products, all of the time. This allows us a 48 hour turnover on delivery times. No job is too big or small – we supply to a range of customers, filling orders from just one trolley to hundreds. We also carry spare parts, operate a trolley hire service and offer servicing and repairs of your equipment. Our on site service vehicles are available 24 hrs a day, 7 days a week for repairs carried out at your premises, minimising impact on your business. Please contact The Trolley Shop in Perth, Western Australia if you would like more information about any of our products or services.